2015 was an interesting year here on the chicken farm. It was crazy busy & with a lot of changes and unfortunately, not a lot of time to write. I sat down this week to look at what I wrote last year and was surprised to see what my most popular posts were. Apparently coop bedding was a subject that had everybody tuning in. Each post I wrote about any type of bedding made it into my top 7 list! The top post surprised me the most as it dealt with the cost of raising a lot of chickens. I mean a LOT of chickens! Since most people have a smaller flock I wrote it for the 'few' people I thought would be curious. I certainly didn't expect it to get so popular! In order from most view/pins/shares....here are my top 7 posts from 2015. By a landslide, this post had triple the view of any other post from this year! How much does it cost to raise chickens? This year after I finished my taxes I sat down with all the chickens expenses and wrote out exactly how much money I spent in 1 year to keep about 80 chickens and guineas....if you've ever thought " I wonder how much t cost to keep a LOT of chickens" then here's your answer! How to train a chicken to walk on a harness & leash Everyone has seen the photos of the chicken harnesses but have you actually tried to walk one? It's not easy at first, but with these few preparation steps it can work out pretty well. Using shredded newspaper as coop bedding I'm always looking for alternative coop bedding materials and this time I experimented with shredded newspaper as coop bedding for a few months. It's practically free and easy to use, but did it work? Keeping your flock disease free: The 8 rules During the big H1N5 outbreak this spring I wrote the post to remind people what steps they can take to make sure they don't contaminate their own birds at home when they visit a farm show, livestock auction of county fair. 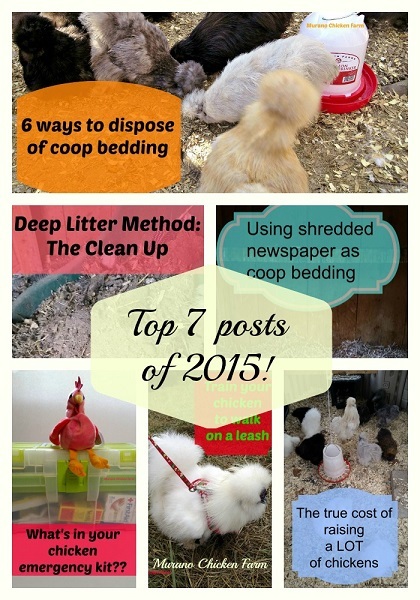 6 Ways to dispose of coop bedding How do you get rid of your coop bedding? I have 6 different ways to get rid of the mountain of coop litter my chickens produce. What is in your chicken emergency kit? If you've had chickens for any length of time you probably have accumulated a chicken emergency kit. I give you a peek inside my kit and explain whet I use each item for or why I have it. I stopped at 7 posts because the numbers got real close after that. These posts all generated a lot of interest and I was thrilled that so many people found them worth reading! I'm so glad that you all joined me in 2015 and I'll hope you'll be here through 2016 as well!